Few days ago I was trying to use a tool called “USB Disk Format” to format my flash drive (NOTE: tool only lists flash drives in dropdown list) so I could use it to install Windows 8 from it. Once formatting completed, I go to my flash drive and behold, all the data is still there?! OK… starting to think that the disk formatter tool didn’t do something right… then I go to my computer and see that my most important hard drive has been formatted instead of the flash drive. When I say most important HDD, I mean two 1TB drives in mirror raid with almost 800GB of data on them (all my projects and most important data are on them). Most of the data is backed up on an offline drive, but never the less I still loose some data which I wouldn’t really like to lose if I don’t have to. This was just a quick format, partition table is overwritten but data is still there. Partition type is now marked as RAW, and each time I try to access it Windows will ask me if I would like to format it since it’s not formatted. Don’t format it because you might make things worse. I couldn’t scan it with chkdsk because it reports that it doesn’t work with RAW partitions. If this was proper format procedure disk would have been marked as NTFS, and it would just be empty. But the application obviously malfunctioned and didn’t do something right (aside from the fact that it formatted the wrong drive) so the partition became RAW and completely inaccessible. 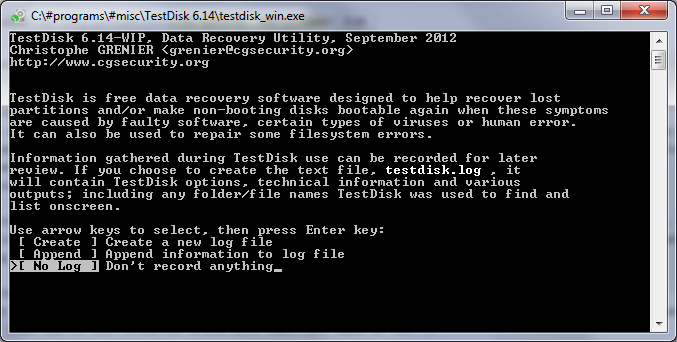 Now download Windows version of TestDisk which you will use to repair MBR partition Table. At this point TestDisk will show partitions that were found, and it should say “Structure: OK.”. Choose you drive and press Enter on your keyboard. NOTE: In case you don’t get “Structure: OK” I think that your MBR partition table is not recoverable, but I’m not completely sure as I didn’t have a situation like that. Once computer reboots your drive should be accessible again, and your problem is fixed. I almost never comment, however i did a few searching and wound up here Undo quick format of NTFS partition. like a few of the remarks appear like they are written by brain dead folks? As you can probably see I don’t write that much at all. I do have Twitter profile @IgorJerosimic. tanks a lot for this valuable article…..